Foxy Hopsy, developed by Jaroslaw Karwacki, is a very fun an unique puzzle game where you flick the spider known as Foxy Hopsy through the chambers of the beautiful but dangerous castle. You goal is to collect all the power ups within the room and exit before the time runs out. The more you collect and the faster you complete the level the higher you score will be. 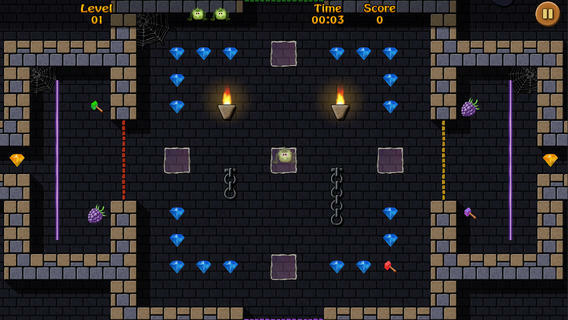 Watch out though, throughout the levels you will encounter traps and enemies. Collect the hammers and other power-ups to defeat the enemies and finish the level. This application offers a very fun and unique game play experience. It can be a bit tricky at times flicking Foxy Hopsy so that you get the little spider into the correct position, but once you do it is very rewarding to see you collect all the jewels and other power-ups. Since the levels are pretty difficult you will not be blowing through the levels very fast. This is great as it leads to more replay value. This application is very entertaining and I am so glad that the developer made it super easy to mute the music and sound effects. Don’t get me wrong they are not bad, but can get repetitive and annoying to some. I actually think the music matches the game play very well. Foxy Hopys features 32 levels, but only 4 of them are available for FREE. in order to explore the rest of the castle you will have to unlock them via in-app purchases. 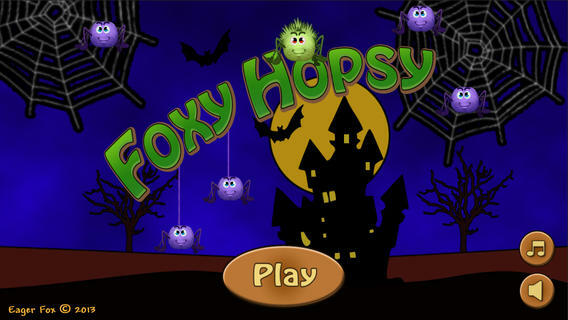 Foxy Hopsy is currently a FREE download from the Apple AppStore. It is a universal application that will work on all of your iOS devices. Be sure to check it out today!